Working with the Oracle of Oddities by Claire Goodchild at Black and the Moon today. 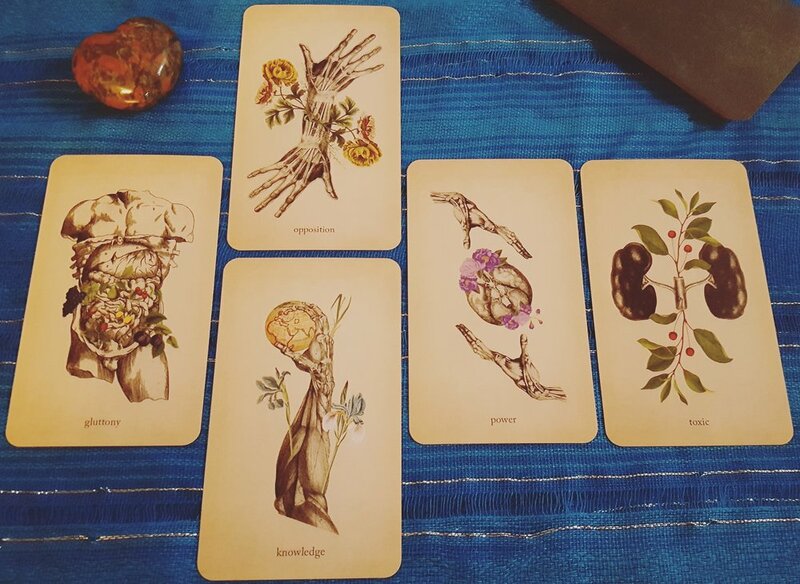 I have been crushing on this deck since I first saw it after tracking down the source of her Antique Anatomy tarot (which is also pretty darn cool, btw). I'm pretty easy when it comes to decks, I have to admit- make it weird and stick a bunch of plants on it and you've got me. The version of the Oracle of Oddities reviewed here is the second edition. The first run went out of print a while ago and I was quietly devastated. I was excited to find out that Claire was putting together a second edition with new cards and made a point to get them as soon as I could. The deck interview went a little weird. Let me see if I can parse this. I'm going to work through this. It feels like this is a deck that requires that I do most of the work. It is not one to turn to when I have no idea where to go. It's more of a guiding hand rather than access to wisdom that I don't already have. Overuse could turn... well, toxic. I will add that the first thought I had when I saw this card is that the antidote to a poison often contains the poison itself. Having had it for a while now, I've also noticed I reach for this deck when reading for others and have had a superb time with it. Clients often see and hear what they need to with hardly more than a prompt from me. It grabs the intuition and doesn't let go until you get what you need to receive. So here's to an odd relationship!